The refusal of a number of world leaders to attend the Winter Olympic opening ceremony will not affect the success of the games. And even though many have called the huge expense of the Games a waste, Putin has called it an investment in national consciousness. “After the collapse of the Soviet Union, after bloody events in the Caucasus, the general state of society was so depressing and pessimistic that we need to shake things up. We need to realize that we can carry out such large -scale projects,” Putin said. But things have not gone quite according to Putin’s plan. 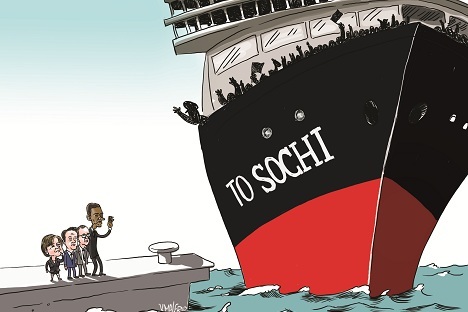 A number of Western politicians began talking about the need to boycott the Sochi Games – arguably over Russia’s “anti-gay propaganda” legislation – and indeed a number of VIPs have refused to go to the Olympics. Among them are the presidents of the United States, Germany, France and Poland, as well as the prime ministers of Belgium and Canada. There have been stories in the press comparing Sochi with the 1980 Moscow Summer Olympic Games, which were boycotted by many Western countries because of the Soviet invasion of Afghanistan. But the absence of these leaders is no real boycott. Unlike in 1980, no country’s athletes are boycotting the Games. Additionally, only a few leaders, including Lithuanian President Dalia Grybauskaite and German President Joachim Gauck, have publicly connected their refusal to attend to human rights violations in Russia. And just as significant as who will be missing is who will be in attendance. The Dutch royal family is planning to attend, despite a series of conflicts between Russia and The Netherlands last year including the beating and arrest of diplomats and the conflict over the Dutch-flagged Arctic Sunrise. Additionally, despite mutual mistrust between Russia and Georgia, Georgian Prime Minister Irakli Garibashvili has offered to help Russia cope with security challenges in the region around Sochi, which is close to the border with Georgia. These examples indicate that the Sochi Games will not be one that shows Russia’s isolation from the global community, but rather a way to promote peace and cooperation between peoples. Just like old times. Gevorg Mirzayan is a correspondent for Expert magazine and a research fellow at the U.S. and Canada Studies Institute at the Russian Academy of Sciences.